As The U.S. Debates Gun Laws, So Does Canada : The Two-Way Prime Minister Justin Trudeau has introduced "common sense gun laws" to help stem the flow of illegal guns from the U.S. However, rights advocates have vowed to fight the law. A detective with the gun and gangs task force removes weapons after a news conference on Project Sizzle, an effort by Toronto Police to crack down on gangs in the city. While the U.S. continues to debate what, if any, federal firearms restrictions to enact in the wake of last month's deadly mass shooting at a Florida high school, Canada is introducing new gun laws of its own, even as opponents there have vowed to fight those changes. Prime Minister Justin Trudeau's Liberal party government has proposed what it bills as "common sense gun laws," including tougher background checks and more thorough screening of people with a history of violence. 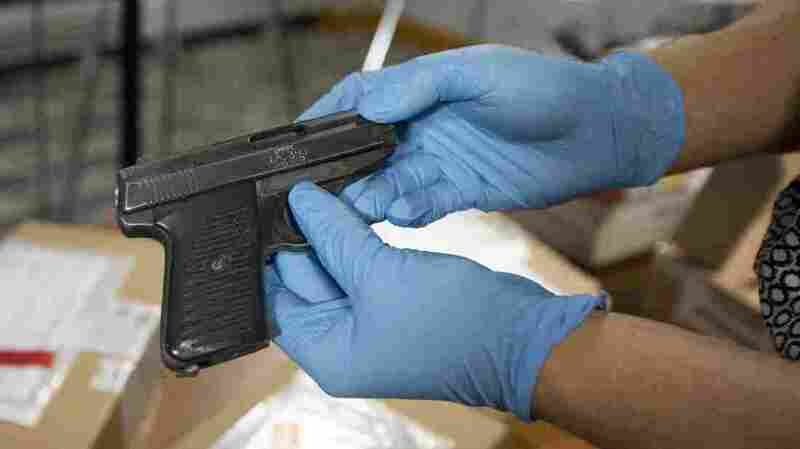 Proponents say the goal is to help authorities investigating a growing problem of gun trafficking blamed on a flow of illegal firearms across the country's southern border. Although Canada's rates of gun violence pale compared to the U.S., they have spiked in recent years, particularly in Toronto, along with trafficking by criminal gangs. The Toronto Star reports that the new law "would require deeper lifetime background checks (beyond the five-year checks currently required) of would-be gun owners but doesn't set out new bars to gun ownership." It would give the Royal Canadian Mounted Police – and not the Cabinet — final say on firearms classifications. Further, it "restores old rules requiring commercial gun vendors to track sales; creates a new legal obligation on all individual sellers of guns to verify with the Canadian Firearms Program that a would-be buyer holds a valid [license]; and would put tougher restrictions on how restricted firearms may be transported," the Star says. "What's the point of having a license if no one ever checks it out?" Public Safety Minister Ralph Goodale was quoted by The Ottawa Citizen as saying. "The process for doing so will be efficient and straightforward." However, the National Firearms Association – which claims to represent 70,000 gun owners and is, roughly speaking, Canada's version of the National Rifle Association – warns that the new law would create a back-door registry inviting authorities to confiscate firearms. The NFA says it will target electoral districts where gun owners can use their clout to pressure politicians. The NFA and other gun lobbyists also fear that the new law could be used to reintroduce the Canadian Firearms Registry established in 1995 to register all non-restricted firearms in the country. The registry, unpopular among many gun owners, was discontinued in 2012. Some types of firearms and accessories that are legal and easily obtainable in the U.S. — such as high-capacity magazines and bump stocks — are restricted or prohibited under Canadian law. In hopes of calming those concerns, Trudeau has insisted repeatedly that the bill has nothing to do with reinstating the firearms registry. According to the Star, "The Conservative Official Opposition had little to say immediately about the measures, but House leader Candice Bergen warned the Liberals 'cannot be trusted' because they treat 'law-abiding firearms owners as criminals. Conservatives will adamantly oppose any attempt by the Liberals to create a new long-gun registry.' "
"Revising firearms laws was an election promise from the Liberals, but little public action was taken until recently. In November, the government announced $327 million over five years, and $100 million every year after, for initiatives to reduce gun and gang-related crime. It also convened a summit with community partners on guns and gangs at the beginning of the month."